Botox Toronto, Can It Prevent Wrinkles? Most of us think that Botox is only used to correct existing wrinkles but studies have shown that Botox can also be used as a preventative measure. As we know when Botox Cosmetic is injected into a specific muscle it gradually inhibits your ability to contract it. When the muscle is not working, or not actively contracting, the lines in that area are definitely softened. Once this process happens the dynamic muscles that contract and causes these wrinkles become unable to form these lines, therefore Botox can prevent wrinkles for as long as it used in those areas. There is a study that followed identical twins over a period of 13 years. One twin received regular Botox treatments into her forehead and frown lines. while the other twin only had the treatment twice during the full 13 year study period. When comparing the photographs you can visibly tell which twin had regular Botox treatments because she doesn’t have the permanently pressed lines or depth of wrinkles that her untreated twin has. The study results show that the lines that normally develop with aging as a result of repeated contractions were greatly diminished in the treated twin but not so in the untreated twin. 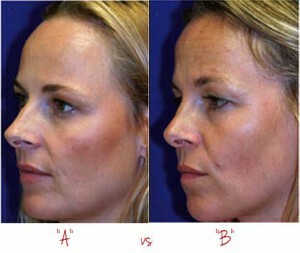 Interestingly they both aged similarly in the untreated areas such as the nasal folds. At Lasting Looks Anti-Aging and Laser Clinic in Toronto we have found similar results with our patients who regularly use Botox !